Web 2.0 projects make me tear up sometimes. Its kind of the same feeling I get when I imagine Matilda going to college or something like that. I blinked and the web grew up without me really noticing. It seems like just yesterday when I coded my first HTML page (ok ok, it was 15 years ago) and now there is the newest site I am excited about, TotSpot. I haven’t even TRIED the website, but judging from other stuff I’ve seen from the development team (called WeBreakStuff), it looks awesome. From what I have read its like Facebook, for your BABY! Perhaps I live too deeply in the technical world, (I registered the domain name for Matilda the DAY SHE WAS BORN), but I think lots of people want to create online spaces for their kids to let friends and family know what is new with their little one. Quite a few friends have asked me to help them put together sites like this one for their kids. 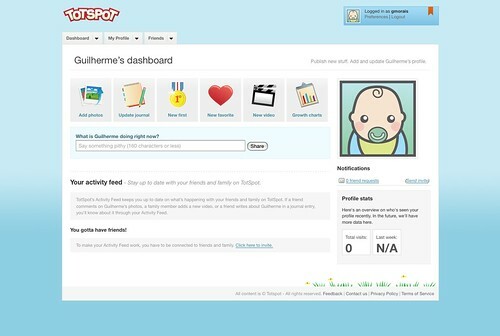 Totspot, from what I can guess in the screenshot and what I have read online, will let you post photos, videos, and milestones for your baby. This is great because right now, I have the photos on Flickr, and the videos on Vimeo and the blog on her site. It would be nice to have it all centralized. The profiles are not available to the public which is great for parents concerned about privacy (poor Matilda, no privacy). There is another site called babyspot that does a similar thing that launched recently, but the design inst as cool. Bundlo and MyBabyYourBaby make baby websites which look pretty nice, but don’t have that web 2.0 zing. By the way, I am a sucker for ways to combine technology and babies, but this just looks crazy. Sure, we all would love to have these kinds of metrics, but who wants to enter all that data in? Trust me, I tried to keep an Excel spreadsheet of poops, pees, pumpings and feedings when Matilda was first born. If it didn’t work for me, it wont work for many. ← Baby Care is Easy! Great post! We are working diligently to improve our site, http://www.babyspot.com, and would welcome any design improvement suggestions. Our site is live and open to the public and we welcome feedback from all. The web is so big, that much like a sandbox where many kids play together, we feel there is more than enough room for both us ant Totspot. Great job on the post!! !